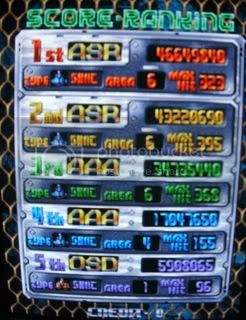 Lets have yet another credit at DoDonPachi!!! 1 credit only, all options default (except autofire, which is allowed). For the moment, I accept scores starting from 40 millions. I may ask you for an replay (.inp file) at my discretion to confirm your score, so if you're scoring high (especially over 100,000,000) I would ask you to record your runs. Obviously for people not using MAME, a photo of the high score board will suffice. I encourage EVERYONE to register their runs, let's contribute to the community! I will most likely accept one showing a similar score; this is just to avoid drama like in previous threads. For recording inps many people use WolfMAME version 0.99. Later versions don't seem to support save states in Dodonpachi, for those of you that like to practice that way. THIS JUST IN: lagless MAME removes 1 frame of input lag from DDP, leaving only 1 (the minimum possible). I haven't tried it myself, but supposedly it's a whole new playing experience, and of course I will accept inps recorded with this version. If anyone takes first place (lol) they will require an inp of the successful run. There is now a selection of replays available for download at the bottom. 29 winteR 81,110,440 A-L 2-6 ??? 35 chum 68,598,350 C-S 2-4 ??? 45 spl 56,991,100 A-L 1-6 ??? Last edited by =SNC= on Wed Feb 12, 2014 6:08 pm, edited 49 times in total. Good job, great to have an updated table. I love to see Zetzumarchen's new 200M+ score up there, keep it up ! Is this still capped at 60? I'd love to submit my score! Are the individual tables capped to five places? Personally, I'd rather have large individual tables and a smaller overall one. Say, 40–50 and 30 places, respectively. 20 overall and 50 individual, maybe? That sounds good too. I prefer large overall and small individual, because ships are fairly balanced in this game and the most important is to see how well each ranks among all players. I'm just gutted my 1-ALL is too puny! I agree with Prometheus here and also it's an assle to keep on editing multiple tables^_^. I think that earning a spot on the scoreboard should be not too easy: what's the sense of a scoreboard if you can play the game for a few days and have your name on it already? Where is the challenge in that? But you can't also set the bar too high or newcomers will be discouraged by the fact that it will take forever to even get on the scoreboard, let alone taking top positions. So I'm asking here: what is a reasonable score that can be reached with a "medium" effort? I believe that score lays around the 50 million mark, so I'm gonna keep 60 position until the last one is a 50 million score; after that we could make a rule that "who gets more than 50 million, deserve a spot on the scoreboard". Well, 50 million is actually pretty high if you don't attempt (and succeed at) full level chains. I'd say 40 should be the entry point, definitely not higher. The reason I wanted larger individual tables was to facilitate using ships other than the one you get the highest score with. I remember some people here enjoying type B more, for one, but getting consistently lower scores with it. I would have said exactly 50M too. That's the score you get when you 1CC and make some light attempts at chaining or getting some maximum bonus, in other words, when you start to take advantage of the basic scoring rules of the game. It represents approximately 1/4 of the optimal score for the first loop. Then again, I feel it's very important to encourage new players to "compete" and display/compare their scores, even if they haven't made so much efforts in that particular game, so I think the best would be a much lower score cap, such as 30M. On place caps: seems we really only have two choices; you can remove the "overall" board, or you can remove all the "individual" boards (obviously my heart is with the former). There's actually a general discussion going on about score board capping here. I'd been meaning to start it for ages, and this DDP thread finally got me into gear! Finally got the 1-ALL. This has been my week. How long did it take to reach this score? P.S. : I will be adding any score above the 40 million mark. My bad, I was more proud about the 1cc than the score. but the past 4 days I have been in the zone. ... there, happy now? Note that next time you are going to post a screenshot or your inp, you are supposed to indicate your score with the format mentioned. Or better yet, use pen and paper so you do not need to get the author confused. Are we clear? Hahaha I said my bad, =SNC= made it clear. before you? You're from Kentucky... is English your first language? Completely screwed up my chaining in 1-4 and died stupidly at the easiest attack of the 1-3 boss, but otherwise I'm pretty happy with this one. I might still try to improve this, as I think I could even break 200M if everything went perfectly. Last edited by Chirpy13 on Thu Aug 30, 2012 12:48 am, edited 1 time in total. After many years, I got back to this game & managed to beat my old high score! I played perfect game (no losing lives or using bombs) up till stage 4 boss, from there it was steady downhill..